Parents have refused to send their children to a school after graffiti which suggested a shooting would take place there was found. The message, daubed on a shelter near Royds School, in Oulton, Leeds, said it would be targeted on 29 March. Police said there was no "substantive threat" and the graffiti was being treated as criminal damage. But dozens of parents posted on Facebook that they were keeping their children at home for the day. Officers were alerted to the graffiti on Thursday afternoon after it was found in a park off Manor Crescent in Rothwell. Insp Lucy Leadbeater said: "This is being treated as an isolated incident of criminal damage and there is nothing to suggest that there is any substantive threat to the school or any increased risk to anyone attending there. "The school is open as normal today and there is no reason for parents to keep their children off." She said police were continuing to liaise with the school and there would be increased patrols, particularly at the start and end of the school day. The officer added: "This is solely because of the level of public concern generated by social media and not because of any information that would suggest any increased threat to the school." Parent Tina Appleyard said it was probably a "stupid prank" but she would not be sending her daughter to school. Another parent posted on Facebook: "I'm not sending my son to school. I know a lot of my friends aren't sending their children either." 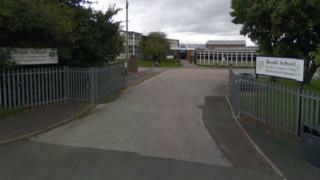 In a statement the school said it had been working with police and the council and would be open as normal. It added: "Should students require additional support in light of recent events in community, support will be available from members of staff."